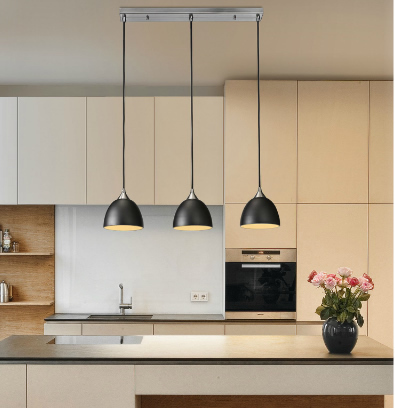 In the kitchen pendants lights can make an elegant feature be they as singles or in groups.... all the more so if the lighting is controlled by dimmer switches. Apart from the kitchens these can be used almost everywhere for ambient and mood lighting. There are a few things that need to be considered if you are contemplating a kitchen décor with pendant lights. First and the foremost, while using pendants in the kitchens you need to ascertain the number of lights that will be required for a well lit space. Usually pendants hang over the tables or kitchen islands and depending on the length of the islands you can decide how many lights to use. Standard kitchen islands are usually anywhere around 6 to 8 feet long. 2 normal sized pendants usually are enough for such standard sized islands. Slightly longer counters can have more lights as required by dividing the counter in equal parts and putting up the lights accordingly. There is a good variety of pendants available be it an industrial design finish or one of the smarter more traditional finishes. Kitchen islands in steel or metal finish will be beautifully complemented industrial designed lights. Pendants look beautiful as porch lights and there are many options available to achieve correct lighting moods using metal, ceramic or glass pendant lights. Pendant lights can be hung over the smaller tables in the middle of the room such as a coffee table which will give you a great setting once they cast their light. For larger dining tables hanging more than one pendant is usually a must. Hallways can also be illuminated with beautiful pendants. Hanging multiple such lights along the length of a hallway will give you a classic appeal. Pendant lights can also be used in the bedroom, especially instead of bedside table lamps. Pendants are not only for the homes but also to be seen in a lot of commercial application such as in restaurants where ambient lighting is required. With such a wide variety of styles, shades and colours, the stunning pendant lights are often your best option for functional efficiency and visual appeal!